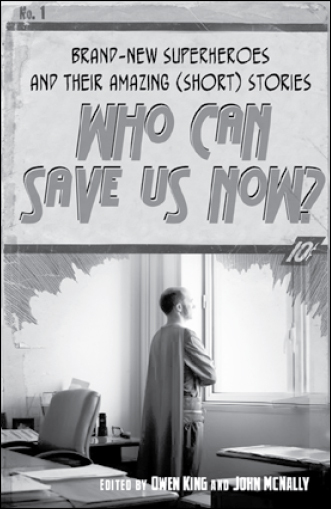 Who Can Save Us Now? Talk about the writers doin' it for you now. I got a copy of this one yesterday and I haven't seen it mentioned here before. It seams to be a collection of short stories about made up super heroes. It's edited by Joe's brother Owen and Joe has a story in it. Looks very interesting. Thanks Lilja! Will it be available in the stores? Yes, it'll be out on July 15. Man, these guys are hold outs on the information market, aren't they?!?!?!? That's great news. Thanks for the info. Do you know the name of the Joe's story? I assume that given that it is a superhero anthology it will be a story we have not read elsewhere before. I also noticed that you can pre-order this from Amazon. Would like to get to the bottom of this if Joe is going to be in it or not. I checked Owen's website and if you look under "News" there is a link to pre-order...no mention of Joe having a story in it. Maybe Shane or Joe can jump in here to clear this up? You can also pre-order it from B&N, but you may end up paying more for it...unless you get a discount! The contributors changed from the time the catalog went out--Joe Hill is no longer a contributor. That's too bad...still, it sounds like an interesting read! too bad, i might get it anyhow. i'll wait and see when there's more info. Of course I'd love to see it contain a story by Joe, but f Owen edited it, it would still be worth checking out - Joe or no Joe. Bummer for sure.....I'll still get this though. It sounds good.